This equipment will be used to monitor the density and distribution of mosquitoes in the divisions and subsequently facilitate control interventions against vector-borne diseases. Mosquito-borne diseases place a burden on health facilities, health supplies and the workforce as well as having an adverse impact on Fiji’s economy, tourism and community stability. 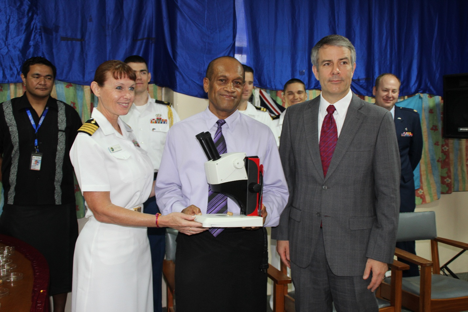 Mr Usamate acknowledged the US Navy for this timely donation and said that this will enable the health authorities to work more efficiently in identifying cases of mosquito-borne diseases. “We are extremely blessed with the donations and with the technical experts who had been mentoring our team and Vector Surveillance and Control capacity development program”. Mr Usamate added that prevailing trends suggests that cases of dengue are likely to rise, therefore urgent action is needed now for its prevention and control.